I was worried at first that my potential excitement for Star War Legion—the new troop based Star Wars miniatures game from Fantasy Flight games—would be tempered by the fall of Runewars or the change in scale from Imperial Assault. Well, I can say that here at Polyhedron Collider we are still really excited to be playing some table top miniatures games in the Star Wars universe. My love of all things Star Wars has meant that I have been keeping a very close eye on this game, but I was surprised and elated to hear my podcast co-host’s glee at the prospect of “Star Wars 40k” as he put it. I have to say that apart from the fiddly movement trays, Star Wars Legion looks a lot like Runewars; custom dice, manoeuvre templates and loads of cards. Personally, I was rather enamoured with Runewars and I can't wait to see how these rules will work on a more squad based game with speeders and AT-STs. I think we can all agree that Century: Spice Road was a bit of a hit, or at least it certainly was in the opulent headquarters of Polyhedron Collider, what with all three members of the podcast team owning a copy. So that means we are all keen to see how Plan B Games intends to extend the game in Century: Eastern Wonder. 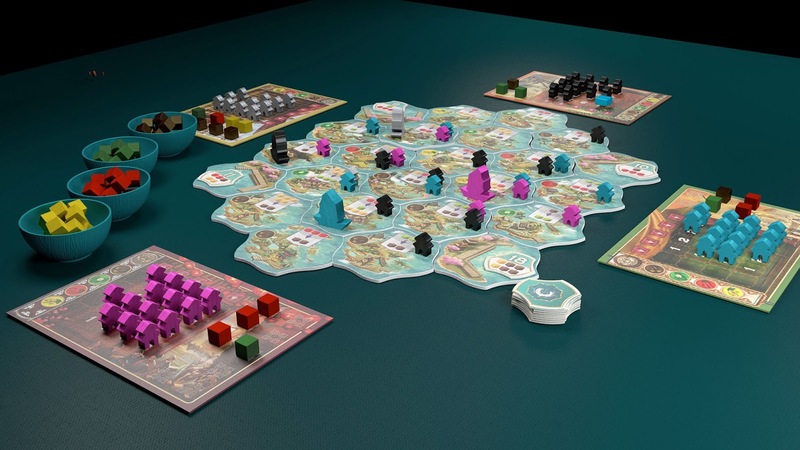 The concept is that there will be three games in total; Spice Road, Eastern Wonder and A New World, and that each game can either stand on its own as a completely independent game, or be combined with any of its brethren to make a larger, more complex game. I have absolutely no idea how that can possibly work but I am really keen to find out. Plan B Games have shown with both Spice Road, and tile laying game Azul, that they can produce games that both play great and look fantastic, so I am really keen to see what they have in store for the future. I must admit that when I first saw this game announced I couldn't work out why someone would make a game about a ropy mid-90s X-files knock off. Then I realised I was misremembering my TV show names and was disappointed. However, if you're a Matt Leacock fan and are looking for the next game in his series of Forbidden games then prepare to get excited. Forbidden Island and Forbidden Desert (due to me trying to lose weight I am playing a rather difficult game of Forbidden Dessert at the moment) are cooperative games in the vein of Pandemic. In the previous games you had to collect items (relics and flying machine components) before nature overtook the board and buried everything under either water or sand. One must assume that Forbidden Sky will follow a similar concept; we can't say more as bugger all details have been announced apart from the statement that this is "an electrifying new game". So it’s got lightning in it then. Although the Forbidden games are lighter than Pandemic, they are still very good, and a great introduction to cooperative games or a great alternative for those people who feel that Pandemic may cause that aneurysm the Doctor has warned you about, best lay off the desserts then. I don't want to set the world on fire, I just want to don my power armour and pip boy and head out into the wasteland. Wasteland Warfare is the second game based on the Fallout series of video games that will be gracing our tables this year but whereas the Fallout board game from Fantasy Flight Games that we acquired not that long ago was an adventure board game, Modiphius’ game is a skirmish miniatures game with some interesting features. No doubt you've heard about the astronomical price of pre-ordering everything for Wasteland Warfare, and a lot of board gamers have got their vault suits in a twist over the price of ordering the complete set. But what you have to remember is that this is a miniatures game, and the price is equivalent, if not cheaper, than going out and buying several Warmachine or Warhammer armies. What makes Wasteland Warfare look so interesting—apart from that there are miniatures for everything from Deathclaws to Mr Handy robots—is that the game will be heavily scenario based with rules for both solo and cooperative play. I admit that I could be wrong but this is the first time I have seen a miniatures game attempt this. We rather like Eclipse here at Polyhedron Collider, it’s got a great blend of mechanics, bridging the gap between euro style resource management and Ameritrash dice chucking, all wrapped up in a beautiful space 4X package. Which is why we are keen to hear more about the upcoming second edition of the game. Some of us (Andy in particular), are keen to see if the game is a complete overhaul, therefore making their purchase of the original and all its expansions obsolete. Whereas I am seeing it as an opportunity to add a physical copy of the game to my library, seeing as I play the app version so much. All signs are that the Second Edition of Eclipse will be tweaking of the original game, ironing out some balance issues (plasma missiles anyone? ), upgrading the components and chucking in the best of the expansions. 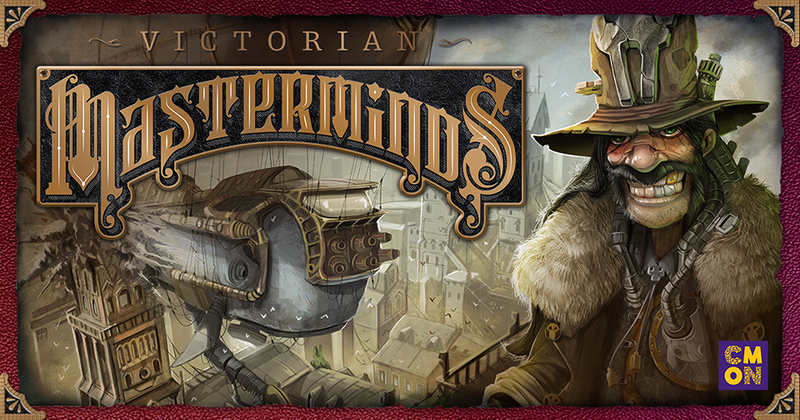 I must admit that I am a bit of an Eric Lang fanboy, which is why I'm rather interested to know more about his collaboration with Antione Bauzer, Victorian Masterminds. From reading Eric's twitter, it sounds like the game has been in development for some time and has turned into a bit of a passion project which makes me even more curious to play this game, especially because of the theme. Sherlock Holmes is dead, and so the evil Victorian Masterminds realise that there is nothing to stop then from succeeding in their dastardly schemes. These plots all revolve around giant destructive stream punk contraptions and it will be your job to build and guide such a contraption to destroy London and evade the Secret service. Central to this game is going to be the construction of your machine, which will comprise of multiple components and therefore have varied special abilities from game to game. The promise is that each game will be heavily asymmetrical as players construct unique devices and who doesn't love a bit of steampunk? Heroes of Black Reach is the latest game in Devil Pig Games’ Heroes of Normandy series, but instead of the slightly cartoony slant on World War II this latest game will be heading into the grim darkness of the 41st Millennium. 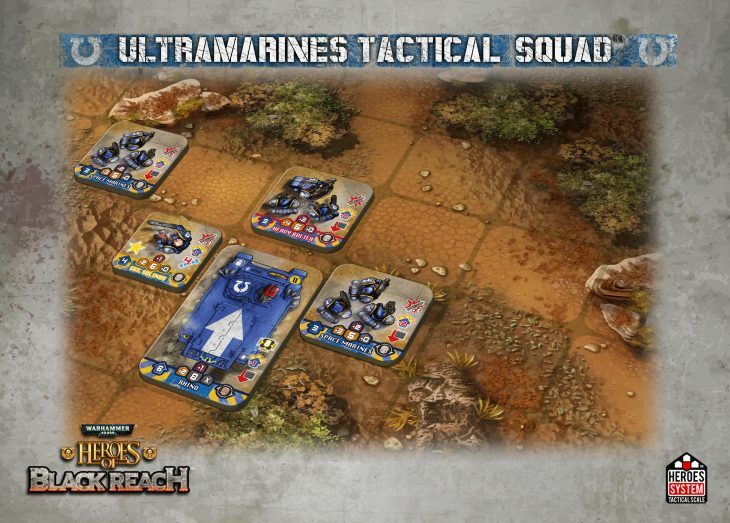 Based on the same game mechanics, you will be controlling squads of Ultramarines and Orks in a plethora of scenario based games. To be fair, this game is a bit of a known quantity. We already know how Heroes of Normandy and Shadows over Normandy play, and most of us are familiar with Games Workshop's iconic power smurfs (sorry Ultramarine fans, I'm a Dark Angels player). At the UK Games Expo we also got a sneak peek at the prototype unit cards and I can say that they looked very pretty. Munchkin actually has a bit of a place in my gaming history. It's one of the first modern games that Jon introduced me to many moons ago and it's also the first ever review I posted on this very site. So I must admit that the Munchkin Collectible Card Game is on this list more as an item of curiosity than because I'm excited to play it. The obvious down sides are that this game is clearly based on Munchkin, which I admit has become cool to hate. It's also based on the collectible card game model, a purchase system often criticised and vilified. On the flip side, however, the Munchkin CCG has been designed by two of my favourite designers, Eric Lang and Kevin Wilson, and I am fascinated to know what they have done to combine the silliness of Munchkin with the competiveness of a CCG and hopefully still make a good game. In these lists we've tried to talk about brand spanking new games, but it’s true to say there are more than a few games where we are looking forward to the expansion and all of us here at Polyhedron Collider are wolfing down anything we can for Mansions of Madness Second Edition. 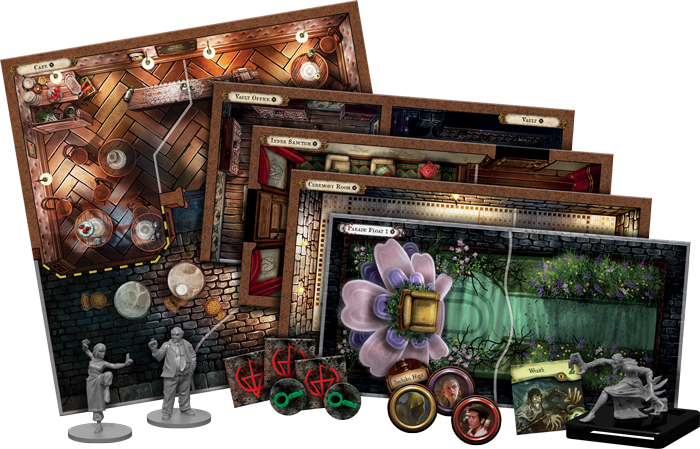 Fantasy Flight Games appear to have adopted the "one big and one small" approach to Mansions of Madness expansions and Sanctum of Twilight looks like it’s going to fall into the 'small' category, which doesn't mean we are any less excited about it. 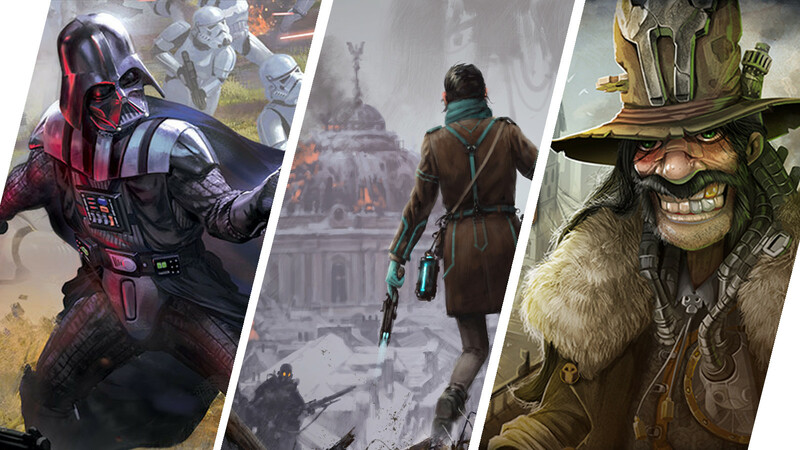 In fact we revel at the opportunity for new investigators, new monsters and, most of all, new adventures but it does mean that we are likely to see a second, bigger expansion coming from Fantasy Flight Games later in the year. For some reason, Steve asked me to write this bit. Lord knows why, it’s not like I have a document love for Stonemaier games. No sir, not me. 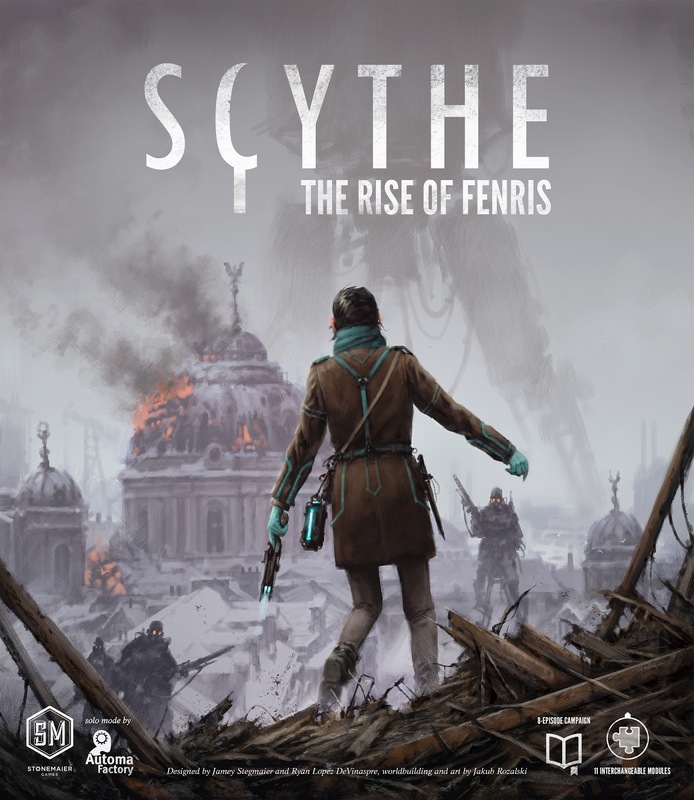 Ok, I lie, I have Scythe and all it comes with thus far so naturally I’m interested in the upcoming (and final) expansion for Scythe, The Rise of Fenris. 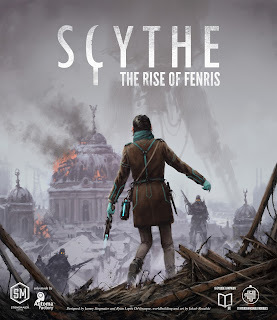 Given that Scythe is already pretty hefty after the additions Invaders from Afar and The Wind Gambit, you’d be forgiven for wondering what, exactly, is missing now. Well, campaign mode for one and a bunch of modular expansions for two. So Jamey has, in his inimitable way combined his very successful approach to Viticulture’s expansion, Tuscany, with the modular approach and taken the relatively new Legacy game uprising under consideration with a resettable 8-game campaign mode which features enduring elements for the duration thereof. So it seems on the face of it that this is a bit of a killer expansion, but then I’m already on board with Stonemaier so I would say that. If there's a game we've forgotten about, and you are really excited to sing its praises from the rafters, let us know in the comments below.